Our drag-and-drop content blocks make it easy to customize your Mailchimp campaign. Use content blocks to add products and promo codes from your online store, share new blog posts with recipients, and more. In this article, you'll learn about the different types of content blocks and how to use them. Here are a few things to know before you start. Code your own templates do not include drag-and-drop content blocks. Use Mailchimp’s template language to add repeatable and variant content blocks to your custom-coded template. Our responsive templates will not constrain images that are not in an Image, Image Group, Image Card, or Image + Caption content block. Large images added to a text block may stretch your layout when viewed on mobile. Choose from a variety of content blocks to build your campaign layout. The available blocks vary depending on the type of campaign you’re working with. Text Add text and wrap text around an image. Boxed Text Add text in a border and choose a background color. Divider Add a horizontal line between content blocks. Image Upload an image to a campaign. Image Group Upload multiple images to a campaign. Image Card Upload an image and add a caption in a border. Choose a unique background color to display behind the image and caption. Image + Caption Upload an image with a caption to the left, right, or bottom. Social Share Add social icons to allow recipients to share your campaign on sites such as Facebook or Twitter. Social Follow Add social icons so recipients can follow you or your company on sites such as Facebook or Twitter. Button Add a button that links to a website or file for download. Video Add a video, with or without a caption. Footer Add our default footer to your campaign. RSS Header Pull in *|RSSFEED:|* merge tags for your feed automatically. Only available for RSS campaigns. RSS Items Pull in *|RSSITEM:|* tags for your feed automatically. Only available for RSS campaigns. Code Add custom HTML to your campaign. Product Recommendation Add product recommendations based on your subscribers’ past purchases to a campaign. Product Add any product from a connected store to your campaign. Promo Code Add a promo code from a connected store to your campaign. Signup Form Add a signup form to your layout. Payment Use it to help visitors buy an item with a credit or debit card, without having to leave your landing page. To insert a content block into a campaign, click and drag the block into your campaign layout. Content blocks can be dragged vertically or horizontally within the template. To move a block, click and hold the handle in the top left of the content block, then drag it to where you'd like it to go. When you move a content block, we’ll highlight the Preheader, Header, Body, Column, and Footer sections to indicate where in the layout you're about to drop the block. When you move a block to a different section, it will take on any style preferences for that section. 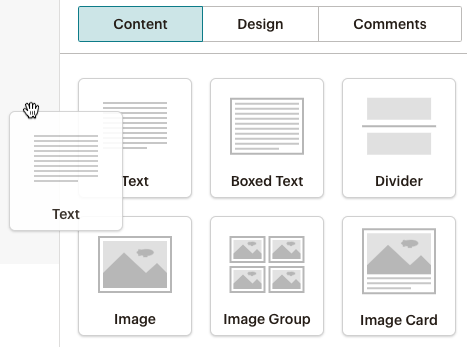 Use the Style and Settings tabs to customize the design of individual content blocks in your campaign. Click a content block to bring up the editor, and choose the Style or Settings tab to make changes. The Style tab is where you’ll make changes to font type and color, text alignment, button appearance, and more. Any preferences applied to an individual block will override style preferences for the section as a whole. The Settings tab includes additional customization options, like the number of columns, where to place an image caption, or which products to display. Each content block type has different Style and Settings options, so try a few to see which best achieves the design you're looking for. To permanently delete a content block, follow these steps. In your campaign layout, click the block you want to delete. A menu bar will appear at the top of the content block. In the Are you sure? pop-up modal, click Delete. Design entire sections of your campaign, including the header, footer, and body. Learn how to add borders, background colors, and more.